"Any kid will run an errand for you if you ask at bedtime." Thanks for Attending the Summer Series Workshops! The 2018 Summer Series Workshops in Chicago has ended and hopefully everyone came home with some great ideas to incorporate into their work! This year we had an attendance record with 65 attendees! They were offered a great educational environment, free WiFi, complimentary nightly reception, rooftop lunches and an evening out to Gino’s East for some Chicago deep dish pizza! Plus there was lots of time inside and outside of the classroom to talk and share ideas among all attendees; the wealth of knowledge shared amongst everyone was incredible! Our IS workshops were broken into two separate tracks, Beginner/Intermediate and Intermediate/Advanced which attendees could switch between as they needed. 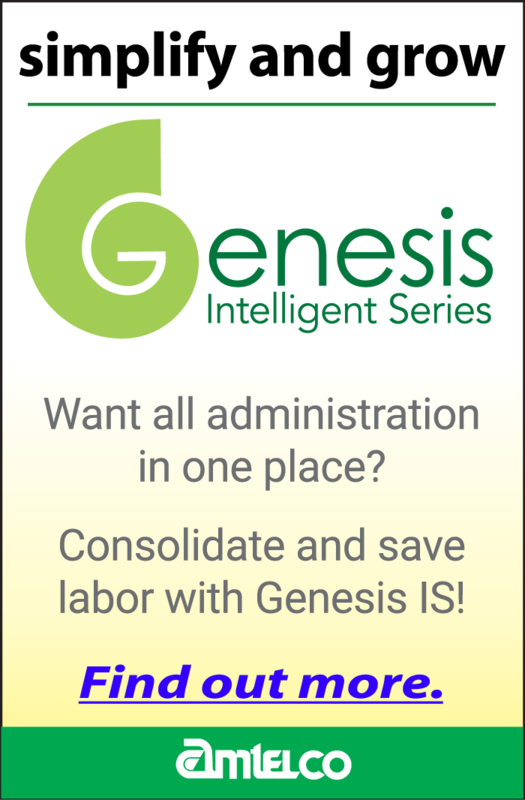 Between the two, they covered everything from Info pages to directories to databases to API’s! Each track also included a step-by-step workbook for the attendee to take home. A new workshop was also introduced this year, the Supervisor Leadership Workshop. Attendee participation was significant making this a wonderful and engaging workshop. We hope to bring it back again next year! In talking with our instructors and what they enjoyed the most, the consensus is the “a-ha” moment when someone says “I understand it now!” and when helping them with specific issues hearing “That worked, thanks!”. Being able to assist others, learning from others as well as meeting new people and being able to talk to their industry peers were among the other highlights for them! The Professional Development Committee (PDC) would like to thank Amtelco for their continued support and for lending us the talents of Michael Quimby, Jordan Beale and Pat Dye. We would also like to thank our presenters Jaimie Guidry of Dexcomm, Rob Beattie of AnswerPlus, Marie McGuire of AnswerTel, Kaylin Cowherd of Advanced Answering Center and Julie Sparklin of Main Line TeleCommunications and their respective employers who lent us not only their talent and expertise, but their time! Last, but not least, we would like to thank all of the committee members and Ewald; for their dedication and hard work to help make the workshops a success. PDC is already hard at work planning next year’s Summer Series Workshops! Please note, if you attended one of the workshops, you should have received an email with our workshop evaluation survey. Please be sure to give us your feedback so we can continue to work on improving our educational programs! If you did not receive a survey, please do not hesitate to email your comments, feedback, and ideas to professionaldevelopment@naeo.org. We invite you to share or suggest ideas for future workshops and webinars. We look forward to seeing you again as well as meeting new faces at the 2019 Summer Series! It was a great 3 days resulting in many new ideas and new industry connections were made! If you have not sent staff in the past or would like to expand your staffs’ skill sets, keep this great education opportunity on your radar for 2019. Chair, Tifani Leal and Vice Chair, Joann Fussell, are the leaders of the NAEO Membership Committee this year. They have been working hard to increase membership, represent you and develop outstanding benefits for all NAEO members. This small, but feisty Committee was able to renew all existing members at the end of December. The goal to WIN back members lost over the last few years has reaped 11 companies back, so far with hopefully more on the way. Currently, we have 152 dues paying members. This diligent Committee has allowed us to focus our attention on more benefits for the NAEO members, strategize to attract SIG (Special Interest Group) memberships and develop more Hospital participation as well as partnering with Tune by offering applicable benefits to each group. Remember, you do not have to be a member to assist in bringing in new members, but we would appreciate it if you would consider this outstanding opportunity to join. 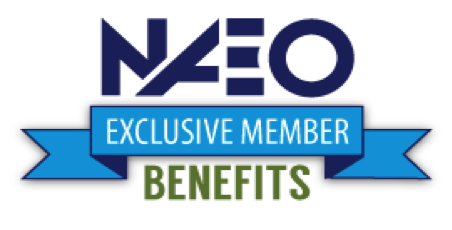 NAEO will be spotlighting Exclusive member benefits and Member companies in Newslinks over the course of the next year. IF YOU are interested in SHARING YOUR story, please let us know. Membership Committee meets monthly by phone where members lead and participate on various projects. Please send any inquiries about volunteering for this committee or having your company spotlighted in Newslinks to membershipcommittee@lists.naeo.org. 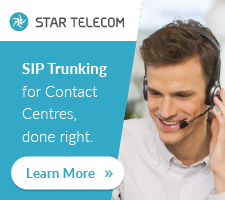 Looking for Email alternatives, Chat options, Op Audio? Check out the Open Source/Freeware Library available exclusively to NAEO members! Brought to you by the NAEO Future Directions Committee. Many of you have likely noticed the banter back and forth between Advanced Answering Center, Inc. and Spectrum Communications recently. Both companies decided to go all in and celebrate Employee Wellness Month in June. We wanted to promote wellness through movement, healthy eating, stress reduction, relationship building and most importantly, FUN! What better way to have fun than to bring the program outside of our own offices in a friendly competition within the industry. The rules were simple. Track your steps for a week. Enter them on a web site and wait for the winner to be announced. And yes, have FUN! Meet co-workers for a hike; go running with your dog; chase your kids! Just get up, and get moving! Every step counts. What our teams took away from this is that healthy can be fun. There are others out there who GET what we do. We are teams that can extend our relationships outside of the work place. It was important to us that this competition be accessible to all employees. We ordered a handful of $10.00 step counters from Amazon and gave them to any employee without a fitness tracker. This one little gesture had amazing results. We had employees who never participate in group activities join in. Their pride in seeing their step counts at the end of the week was the true win of this event. Taunting the other team, with some good natured trash talking, also helped to keep everyone laughing and motivated, and it even resulted in some late-night walks taking place - due solely to power of being psyched out. Now it is your turn. Advanced Answering Center and Spectrum Communications would like to challenge all NAEO member companies to a STEPtember Walk Off. The event will begin at midnight on September 23rd and end at 23:59 on September 30th. The winning team takes home this awesome trophy and bragging rights! A list of every team’s MVP will also be provided. Everyone one will have something to celebrate! 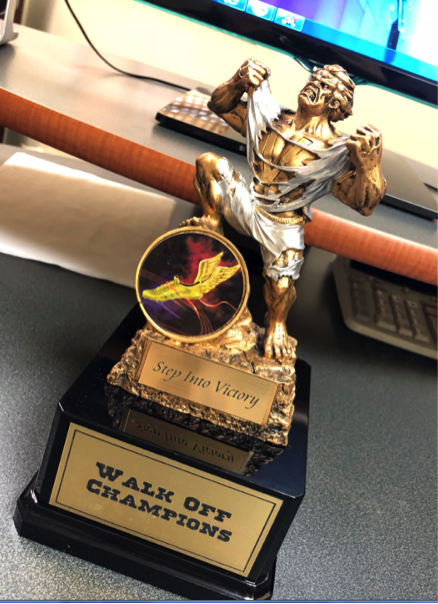 If you are interested in joining in on the fun please email Jamie Hay at Jamie@spectrum-communications.ca by September 20, 2018 so we can have your company information added to the Walk Off tracking site prior to the event taking place, and can provide you with the website address to share with your team. All that is left to do is lace up your shoes, sharpen your trash talking skills, and hit the streets. We will be right out there with you, and cannot wait to see (beat) your results. “A healthy attitude is contagious but don't wait to catch it from others. Be a carrier!"